Not wearing sunscreen is a cardinal sin for any skin care devotee – but if you’re put off by memories of thick, pore-clogging formulas, it can be easy to avoid it. Enter, The Ordinary. Stripping back unnecessary packaging and misleading ingredients, every product in the range is game-changing and this SPF is no exception. Combining ultra-refined zinc oxide and titanium dioxide (no nanoparticles) with a bio-active antioxidant network, a hydration complex, skin-identical non-comedogenic lipids and Tasmanian pepperberry, this formula offers innovative SPF protection and free radical-fighting, nourishing support. 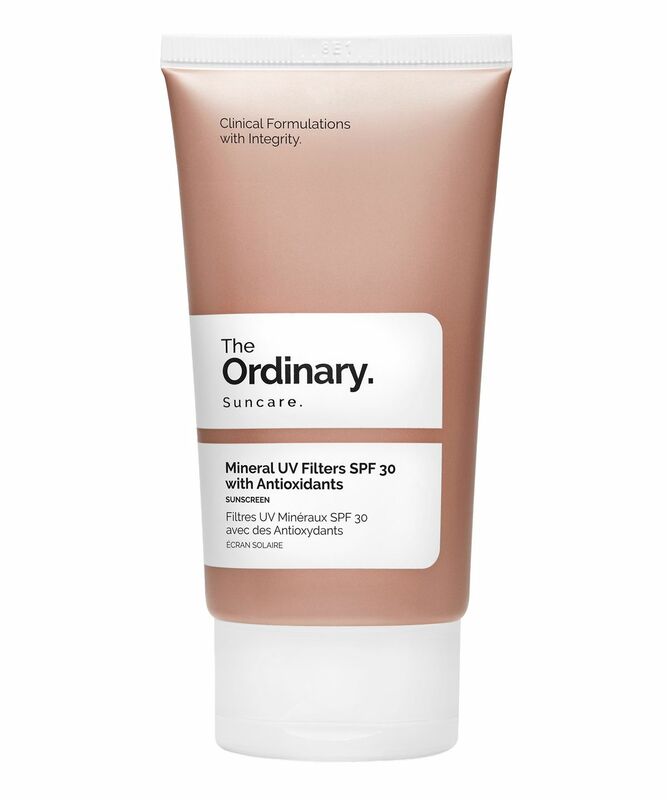 An innovative take on sunscreen that does so much more than guard your complexion against the harmful, ageing effects of the sun (though it does that very well indeed) The Ordinary’s Mineral UV Filters SPF 30 with Antioxidants offers unrivalled protection. 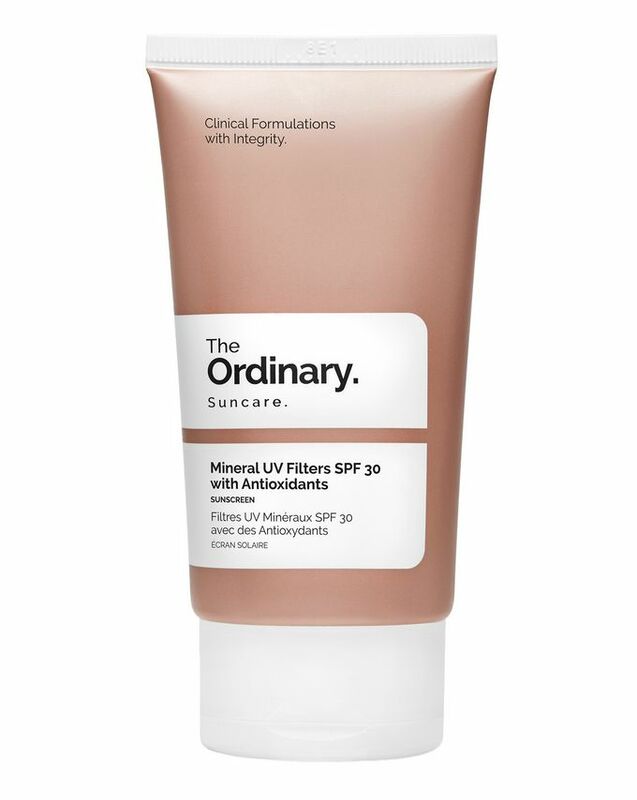 Avoiding the use of nanoparticles (these are small enough to penetrate your skin and get inside your body), The Ordinary has formulated this sunscreen with ultra-refined zinc oxide and titanium dioxide, suspended within non-comedogenic (non-pore-blocking) silicones. This allows the formula to remain extremely lightweight and prevent it from over-burdening your skin. An advanced antioxidant complex scavenges and neutralises free radicals, minimizes the intensity of UV radiation penetrating the skin, while a bio-sugar complex provides both short and long-term hydration and also naturally increases skin’s own capacity to hold water. Finally, Tasmanian pepperberry helps to calm stressed skin for a soothed finish. I saw a lot of negative comments about this product but I couldn't believe The Ordinary could make something that bad, so I bought it. It's a disaster. It's impossible to spread around my face. It lays as a thick white mask and doesn't absorb. Moreover, it makes flakes on my face skin. Absolutely NO. I love The Ordinary but this product is a big flop. This sunscreen leaves a heavy feeling to my face. Most importantly, it makes my face so white and ashy that it’s even impossible to cover it with my foundation. Will never ever repurchase. I mix with my moisturiser. It’s not greasy and goes on the skin nicely. I have oily blemished skin and this works well for me. I bought 7 items at one go after I learned about The Ordinary. I have yet to try them out one by one. Once I applied this Mineral UV Filters SPF30, I immediately ordered 2 more. From a person who practically drinks sunscreens, this is the most suitable for me. Yes, the zinc Oxide leaves a white tone but it disappeared quickly. With good UV filters (from the ingredients list), the non-oily texture and the good price, this is the best sunscreen lotion I've tried so far. My favorite sunscreen is Survival 30 from Niod.I also like The Inkey list Zinc oxide cream.The one from The Ordinary is really good,I love the texture(it is kinda thick,but in a good way,for me),it has so many antioxidants and ofc one more good thing is that it's only mineral based(like Survival),whereas The Inkey list one is mixed:(.It's true that it leaves a cast,it really does and I get why many don't like it just because of this.I am an Nc 20 and I guess if you are darker than this it's worse.I used it with and without foundation,maybe the darker people can only use it under foundation?It would be a big con then...but for me it really works,I love it,it's really good and to be honest,I don't mind that cast at all,it kinda sinks in the skin and 90% of it disappears. It’s not hydrating at all and catches on dry patches. Leaves a very noticeable grey cast as well. I simply love this product. Also its perfect underneath the make up instead of the primer. I'll definitely repurchase it. It does have a strong white cast but it soaked in eventually, but I'm pretty white so it may be worse on a darker complexion. Not very moisturizing, sticky and generally a disappointment. I'll keep it for my body for the beach but I'm not going to use it on my face again. I couldn't use this product. The cream is way too thick and does not spread. It actually made my face quite a disturbing white/grey/purple colour! So awful I had to remove it. I put some on my arm to see if it would eventually soak in but an hour later there was still a white tinge. I absolutely love the other products I have bought from The Ordinary, especially the Buffet and retinol. Very disappointed in this one. Left me with a very pale face. Product doesn't absorb into the skin at all (and I have very thirsty skin); it just sits on the surface and makes a terrible base for make-up. Real shame as I've loved the serums and oils that I've tried from The Ordinary. I love it. looks white, but it really disappeared quickly. Ingredients list is more important for me. This is too tick and it leaves my face white, it feels heavy on the skin during the day, also I felt a bit of itching after applying over vitamin C.
Bought this with high expectations as I love a lot of products from The Ordinary, but I am very disappointed. The cream itself is very thick and only small amounts take a long time to rub in. It leaves a white ish/purple cast in your skin too, meaning i usually have to cover my whole face in concealer/foundation. Also found it’s made my base very dry and hard to skin with, even with moisturising primers. Would prefer if it had a consistency more like a moisturiser. Very white, and I have pale skin! I am assuming that it has good protection but it is very white and takes ages to blend in. I have quite pale skin and it is still too white for me. Also it's very thick. A little goes a very long way though. I used this a couple of times and then found my skin was stinging - not sure if it was this product or something else but I had to stop using it. As with many mineral sunscreens it leaves a very white sheen and was difficult to get it to sink in. That said - it was not at all greasy like some sunscreens and if you wanted to wear it under makeup the white sheen didn't matter and it was a pretty good base. Disappointed as in general I love The Ordinary products. Very thick cream, doesn‘t sink in, looks like you have a white maks on, made me break out a lot. Very disappointed!